Baltic or eastern Rus viking sword chape with oriental palm motif. This a special and rare type of Viking-Age sword chape. These kind of sword chapes can be devided in three specific groups, all being characterized by their 'closed casting', their distinct execution with oriental (palm) motif and their sometimes remarkable size (lenght). On these chapes the typical Scandinavian animal ornament had been replaced by a oriental palm (motif), although the Nordic nature of the form is there, the openwork charachter had been replaced by a closed casting. 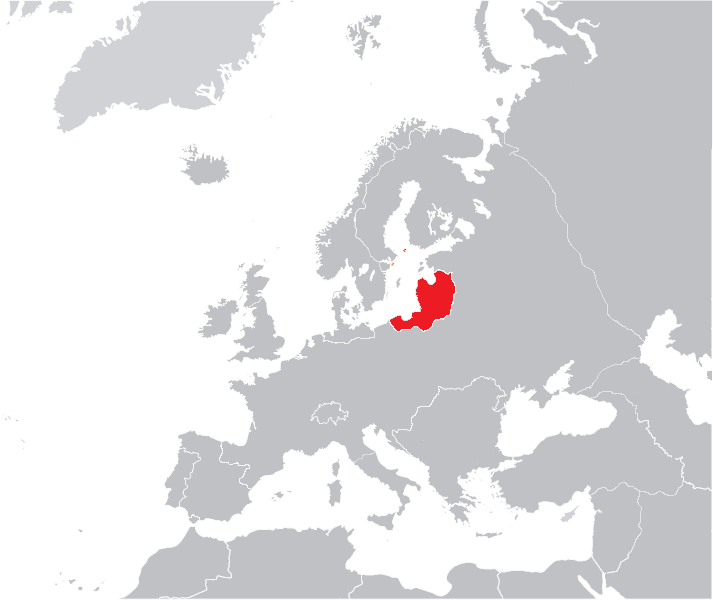 - a Baltic-East Prussian group. I'm not quite sure if the sword chape here discussed is of Varangian-Baltic origin, or of Baltic East-Prussian origin. It's lenght - 12 centimeters - (4 3/4") finds a parallel in a sword chape of Varangian-Baltic type, being found in Beszterec in Hungary, although it is less ornamented especially on top of the chape. As not is known where this sword chape was found, we have to concentrate on the specific area to wich this sword chape had been addressed to: East-Prussia. 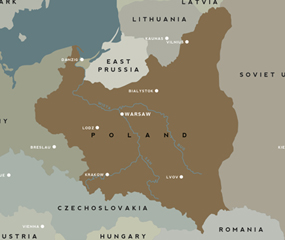 Of course, 'Baltic' and 'Baltic-East Prussian' are modern addressed names to define an area geographically where these kind of chapes were found. The Varangians term however is a true ancient describtion given by the Greeks and the East-Slavs to vikings who between the 9th and 11th centuries ruled the medieval state of Rus' and formed the Byzantine Varangian Guard. Here we get to the centre of the explanation why a oriental motif like the palm is appearing on these kind of chapes. The original production and origin of the kind of chapes addressed as 'the Varangian Group' is situated in the area of Kiev, and found their way of origin even further east on the Wolga river. 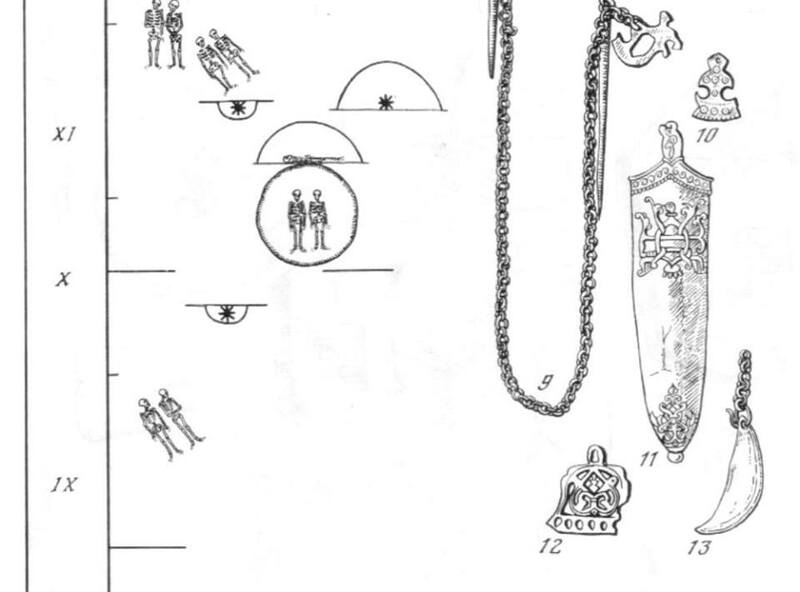 Whatever the group it belongs to, the sword chapes with this distinct motif had been found in a great area, consisting finding spots as: Madara in Hungary, the area of Kiev in Ukrain, Philippopel in Bulgary, Biljarsk in Russia, Zloczöw in Poland, Latvia, and besides several other area in East-Prussian, Linkuhnen in East-Prussia (toda's northeastern area of Poland). Why it has its wide area the map of the Varangian trading routes shows us. One of the (marked orange) trading routes leads directly to East-Prussia. Travelling all their way to the deep south of Russia and to Constantinople, the Varangians must have either copied an already excisting motif or find their inspiration on the oriental motif of a palm, in use in the southern areas wich whom they travelled. With a addictive intrest in everything from far beyond the known (as can be seen by the trading in beads coming from the far south and Byzanthium) it is no wonder these motifs found their way north. Nevertheless, these kind of sword chapes - as to my current knowlegde - haven't been found in Scandinavia itself. 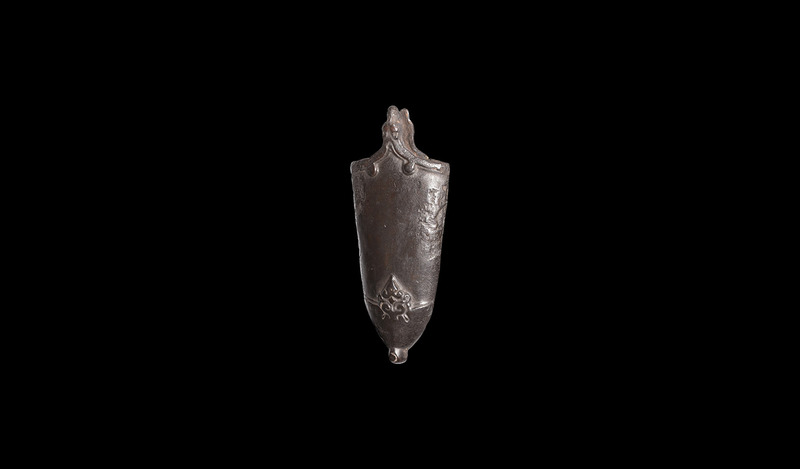 The 'magnus opus' of both size and ornament on these specific kind of sword chapes can be found in the group being found in Treyden in Latvia. Being 22.6 (!) cm. length and 4,6 cm width with outstanding ornament execution, this sword chape is one of the finest known from the Viking-Age. Several images can be seen in the book wich I refer to. The drawings of other sword chapes with oriental palm motif are from a Russian book, wich title I still have to discover and will address later on. Paulsen, Peter, Schwertortbänder der Wikingerzeit, 1953: Ortbänder mit orientalischer Palmette, p. 59 - 87.